Yacht brokerage unit sales in July were lower for the first time in 2010, compared to the same month in 2009, according to YachtWorld.com yacht brokers reporting in the proprietary SoldBoats.com database. The drop was small, 4 percent or 127 boats, and values were 2 percent higher, but the dip in sales extended a sales curve that&apos;s continued to flatten against 2009. Unit sales were 3,053, versus 3,180 in July 2009, but it was the fourth consecutive month that sales topped 3,000 boats, a stronger market performance than either 2008 or 2009. Total sales valuation for July was $282 million, up from $277 million. Year to date, valuation is up 25 percent, at $1.9 billion and unit sales are up 16 percent to 18,841 boats. The number of powerboat and sailboat sales dropped about the same percentage in July, compared to July 2009, but sailboat valuations dropped 11 percent while powerboat sales were up 4 percent. Looking at sales among different size boats, bigger-boat sales were generally higher, while boats under 45 feet fell 3 to 7 percent in units and 8 to 12 percent in values. The market was strongest among boats 46 to 55 feet, up 12 percent in units, and boats over 55 feet, which was up 24 percent in value. A positive note for sellers and brokers was that the average time to sell a boat has begun dropping. In July, it took an average of 279 days to sell, which was essentially the same as 2009. Year to date, the average was 288 days, up 7 percent compared to the first seven months of 2009, but the first time the average has been below 300 days in several months. For this issue, we took a look at the July sales data for Florida, the biggest brokerage market. Not surprisingly, it reflected many of the national trends. 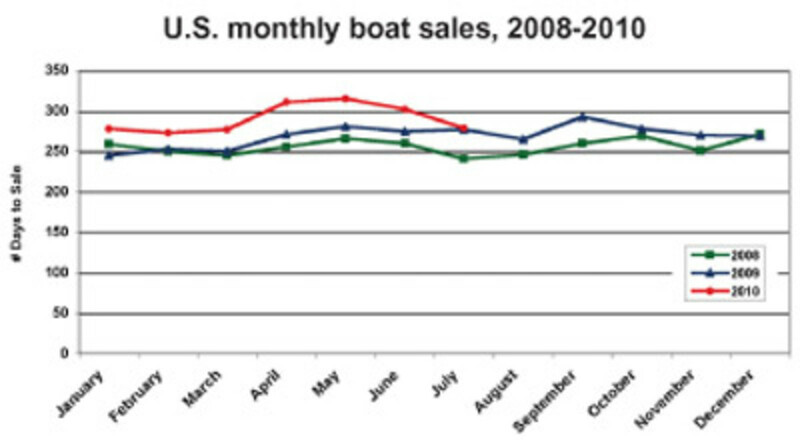 Sales were even slower than nationally for boats under 45 feet, yet they increased in total valuation. Brokers sold 81 boats over 46 feet, up from 73, with a total valuation of $64 million, a big gain over $45 million in sales the previous July. Year to date, brokerages in Florida have sold 3,660 boats, up 16 percent. The sales were worth $798 million, an increase of $187 million, or more than 30 percent. The average time to sell a boat has dropped below the national average, to 264 days, year to date. Despite that improvement, it&apos;s still one week longer than the average a year ago. In the last seven months, Florida brokerage sales are up in all size ranges compared to the same seven months in 2009 and they have increased 30 percent or more among boats 36 feet and larger. Total valuation has grown between 33 and 36 percent in the larger size ranges.